March 7, 2011 May 31, 2012 Nefer Khepri, Ph. D.
This deck is impressive from the start in a number of ways. First, the packaging. Schiffer has done another wonderful job with one of Emily’s decks. 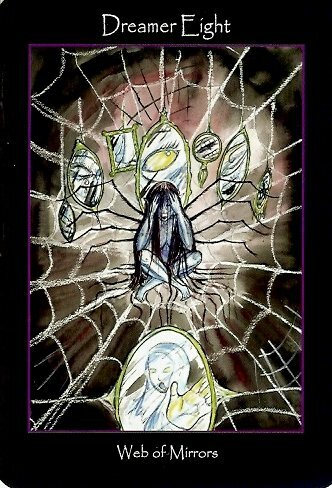 Like the Transparent Tarot and the Transparent Oracle (both by Emily & published by Schiffer) The Tarot of the Sidhe comes boxed in sturdy laminated cardboard. Packaging is compact, just slightly larger than the cards themselves so they pop out of the box easily, unlike decks published by Hay House (by Doreen Virtue & others) that are packaged so tightly that it results in a battle of wills to get all the cards out of the box without denting any of them. The cards are 3 1/2″ by 5″ and are all nicely laminated and printed on thick card stock. Although larger than average, I found that the cards do shuffle well. The card back is a Sidhe Glyph designed by John Matthews, author of over 90 books on Celtic mythology & co-creator of the Arthurian Tarot. The background of each card is black with a 1/4″ border all the way around. The number of the card appears at the top, the name at the bottom, both of which are done in white Papyrus font within the black border. I like the black borders because they help to make the bright colors of Emily’s artwork pop right off the cards. These cards look stunning against a black reading cloth. The guidebook fits right in the box along with the cards and is a self-contained paperback. It begins with a forward by John Matthews. The guidebook is quite impressive. It begins with the major arcana and each card concludes with a section entitled, “Artist’s Notes,” for which Emily provides information on how the image came to her. In many ways, this section is as important as the actual card interpretations & as an artist I found this portion of the cards’ interpretations to be very interesting. A brief list of keywords is also provided for each major arcana card for those of us who do not wish to read the entire interpretation, but I strongly advise you to do so because you’ll end up getting a lot more out of the deck. The section on the minor arcana has a short poem of 4 – 5 lines for each card that aids in its interpretation, followed by a number of keywords. All card images are illustrated in the guidebook so it’s a good reference if you wish to use it as a study guide. 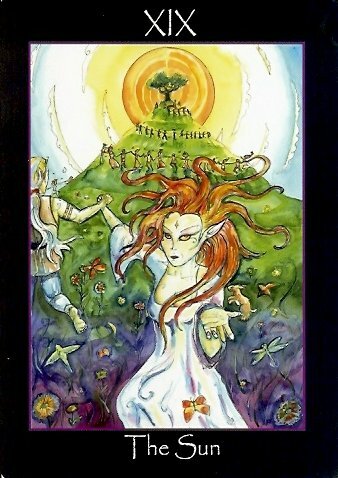 The guidebook concludes with a meditation one can use to enter each card and to interact with the Sidhe depicted and the landscape. Spreads include: The Pentagram Career Spread (6 cards), The Hexagram Relationship Spread (7 cards), and the Septagram Spread of the Whole Self (8 cards). Emily concludes her guidebook with a hauntingly beautiful poem entitled, “Song of the Sidhe” that brought tears to my eyes. Two of the major arcana have different titles. The Hierophant in this deck is called The Elder and the Devil is called Pan. Justice is major arcana VIII while Strength is placed at XI. 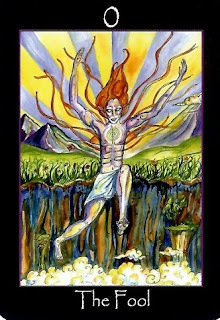 The minor arcana specific to this deck are: Dreamers (Air – Swords), Warriors (Fire – Wands), Dancers (Water – Cups), and Makers (Earth – Pentacles). All minors are fully illustrated and each card has a title related to its meaning. I found the imagery on the court cards to be very helpful in conveying their meaning. Interpretations for the most part follow traditional RWS. When reading Emily’s section on “Creating the Deck,” I was very surprised she used watercolors. The colors are so bright, full-bodied, and vibrant that I assumed she had used acrylic paints. The imagery has a nice free-flowing quality to it and Emily tells the reader that the images were channeled by her from the Sidhe. The cards do have a very otherworldly appearance and feel to them not readily apparent in other fae/faery related decks that I’ve seen over the years. The artwork itself is gorgeous and it’s obvious each image was rendered from the heart and soul. The deck amazed me by immediately working for me straight out of the box. Many readers “season” their decks by first cleansing them with incense, sleeping with them under their pillow to merge their energy with that of the deck, and so on. Tarot of the Sidhe required none of that in my case. This may be different for others, I cannot say, but I was quite delighted the deck began to work for me immediately. 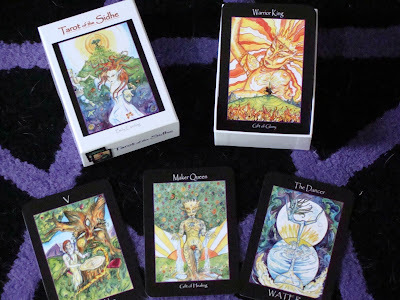 Personally, I have no close connection to the Sidhe or to the fae world in general, yet the energies of this deck blessed me by speaking directly to me. Upon reading the interpretations for the cards I had drawn I heard, “Come! Take our hand. Join in the Dance of Life.” Once again I was stunned, more so considering this was the first time I had ever looked at this particular deck. Regarding ease of use, the inclusion of key words for all cards makes this a very easy deck to use. Knowledge of esoteric systems and symbology is not required as Emily nicely dances to the beat of her own drum. Therefore, even newcomers to tarot would find this deck pretty simple to use. The only possible drawback of this deck is due to ignorance of the type of energies embodied by the Sidhe. The eyes of the figures do not contain irises, which can give the characters portrayed on the cards a somewhat creepy look to someone who is not used to using a tarot deck. In fact, I read one reviewer on Amazon who went so far as to refer to this deck as “satanic” for that very reason. I found that to be completely uncalled for based upon the intense positive energy I felt emerge from these cards the first time I used them. This is a classic case of “to each, his/her own,” but anyone who loves tarot, the Sidhe, and beautiful art would benefit from the deck. I highly recommend this deck to all.